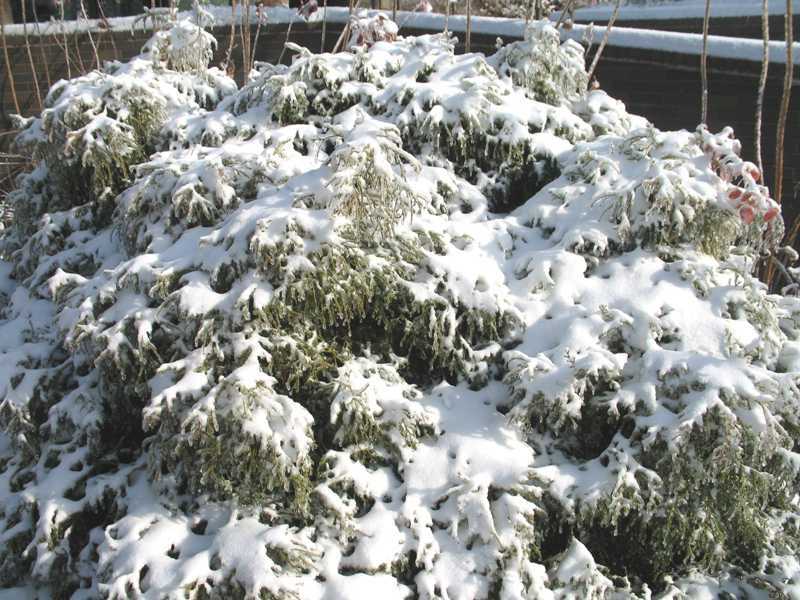 The range of needled evergreens that perform well in the lower Midwest is few. To keep the trees in top health you should be aware of and control the following top problems we see at the Kemper Center for Home Gardening. Bagworms are common on junipers and arborvitae. Caterpillars hatch in spring and form a protective bag as they feed on foliage. Handpick the bags whenever present. A good time is in winter or early spring before the young hatch from eggs inside the bag. Insecticidal sprays used early when young hatch are an effective control. 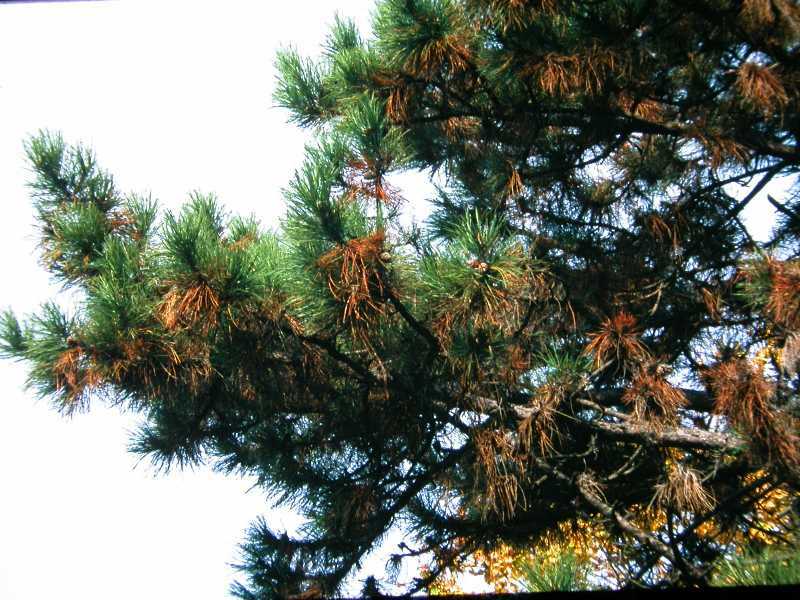 Homeowners are often alarmed when needles on their needled evergreen, such as pines, arborvitae, spruce, and junipers, turn yellow or brown in fall. If yellowing needles are confined to inner older needles, the most likely cause is normal shedding of needles. 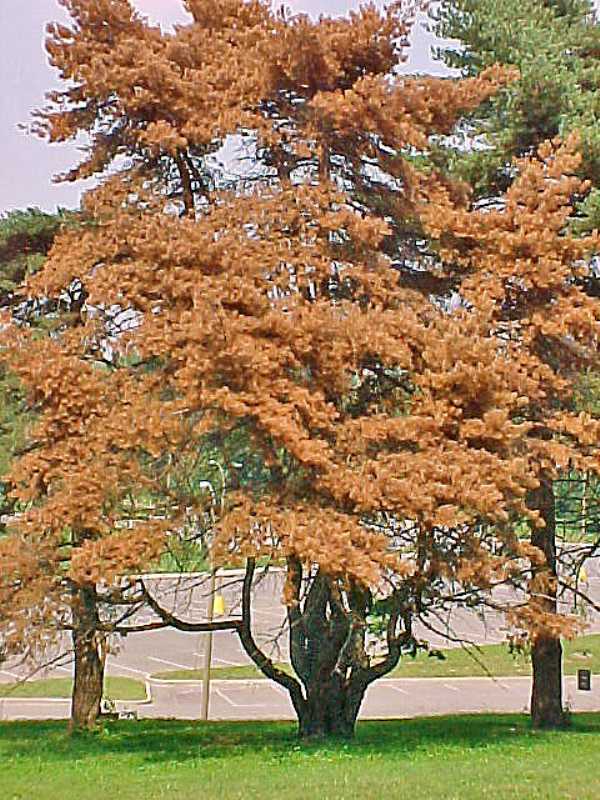 Dying tips or whole branches, however, are not normal and may be a disease problem. This tip blight is very common on Austrian pines in our area. You can recognize it by the tips of branches turning brown and dying. The disease usually starts on the lower branches and moves up the tree. Progression is slow, but the disease will deform and eventually kill the tree. Sanitation, such as pruning out infected tips, can slow the progress of the disease. 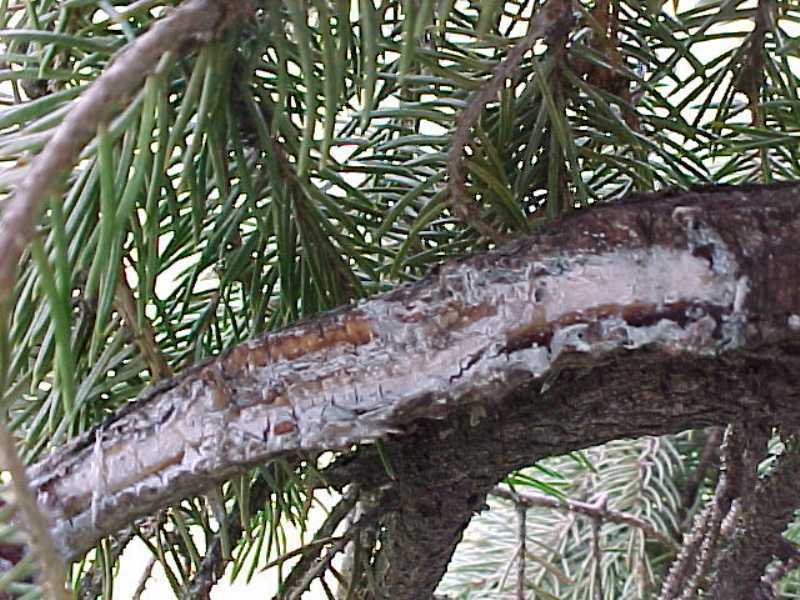 Dying lower branches on spruce are often caused by this canker disease, which kills the branch close to the trunk of the tree. 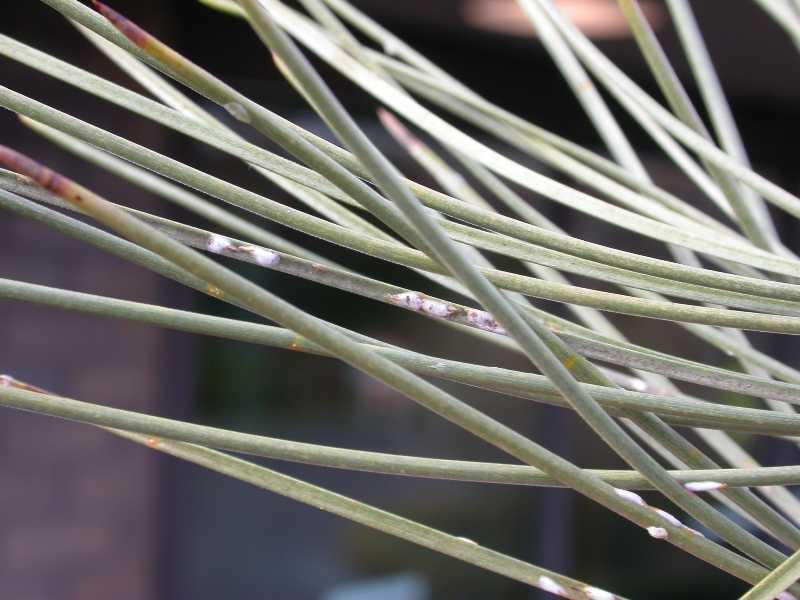 We often receive pieces of dying tips of spruce branches but few patrons bring in a whole branch or examine the branch further back to see if something there may be causing the problem. A close examination should be your first inclination when you see dying branches on spruce. 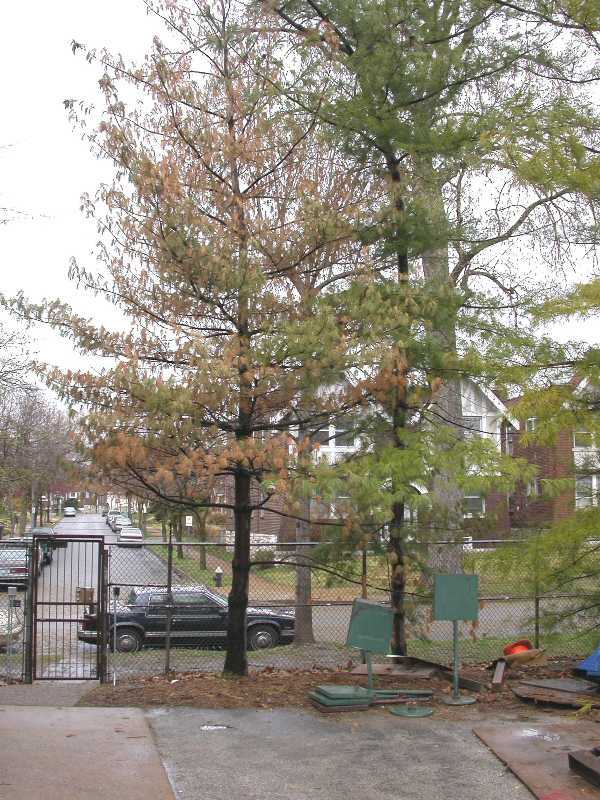 White pines are not well adapted to our heavy clay soils and hot humid summers. Consequently, they may struggle to establish a robust root system. They can decline over time and/or develop other disease problems. 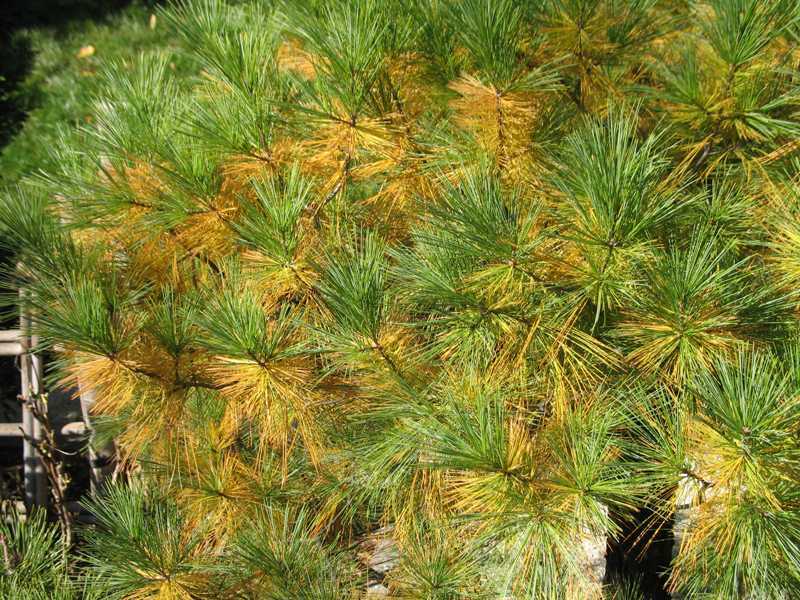 Provide white pines with a good well-drained soil and ample moisture during dry periods to give them a fighting chance. Winter weather, including fluctuating temperatures, snow build-up, and ice, can damage trees. There may be little a gardener can do to prevent these damages, but removing damaged limbs by proper pruning and limiting other stresses such as lack of water can help plants to recover. This disease is caused by the proliferation of a small microscopic nematode. They grow in and clog the water-conducting tissue of some pines. Scotch, Austrian, and Japanese black pine are most affected in our area. 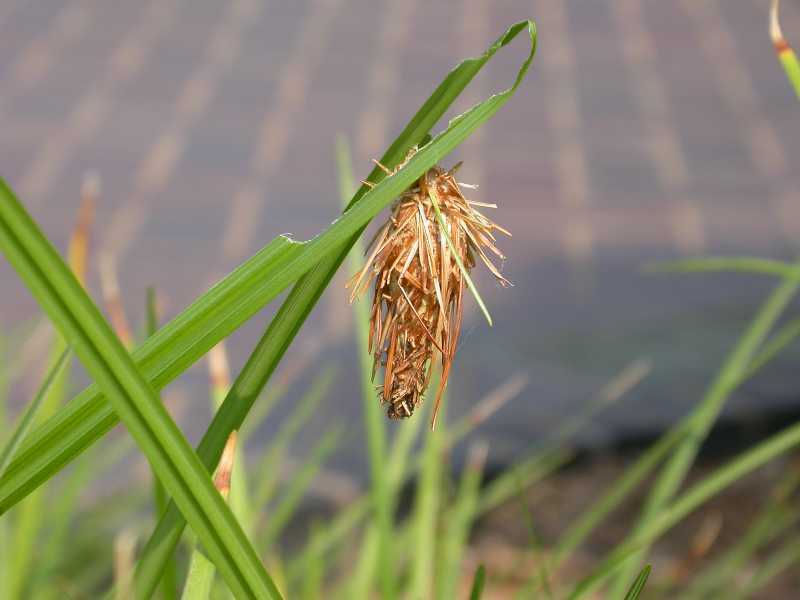 Needles lose their bright green color and quickly become dry and brittle due to the lack of water. There is no cure. 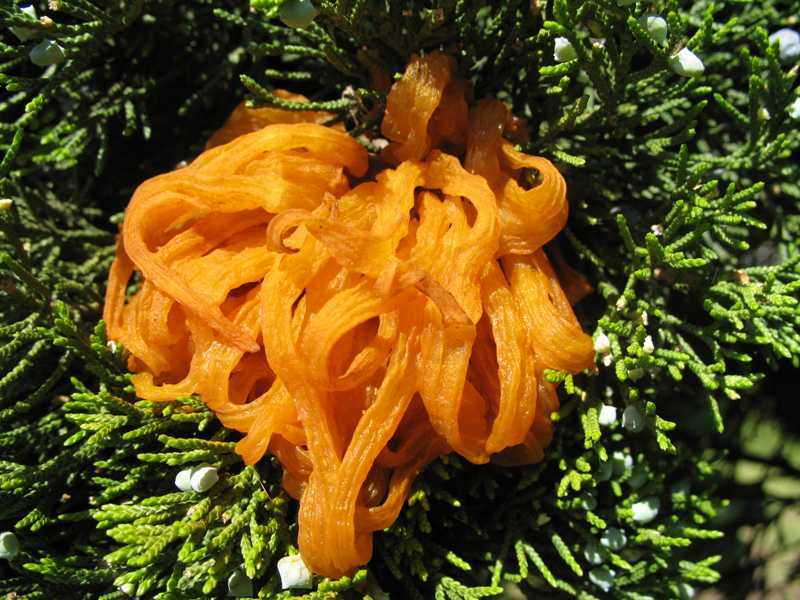 Those golf ball-size brown growths (galls) on junipers that develop bright orange “horns” are the fruiting bodies of a very common rust disease that moves back and forth between juniper and apple. On apples the disease results in a leafspot. Pruning out the galls on junipers in winter is an effective control. This scale may go unnoticed unless you examine your pines closely. On close inspection the ¼” white scales are very evident. Control should be initiated when the young hatch from eggs protected under the scale. They crawl around the plant to infest new needles. During this crawler stage the insect is most susceptible to insecticides. Mugo pines are very susceptible. These caterpillar-like insects, which are actually the larvae of a sawfly can result in rapid defoliation of last year’s needles. Their feeding time is short and new needles will grow from buds at the tips of the branches. Quick action is required if defoliation of needles is to be stopped. 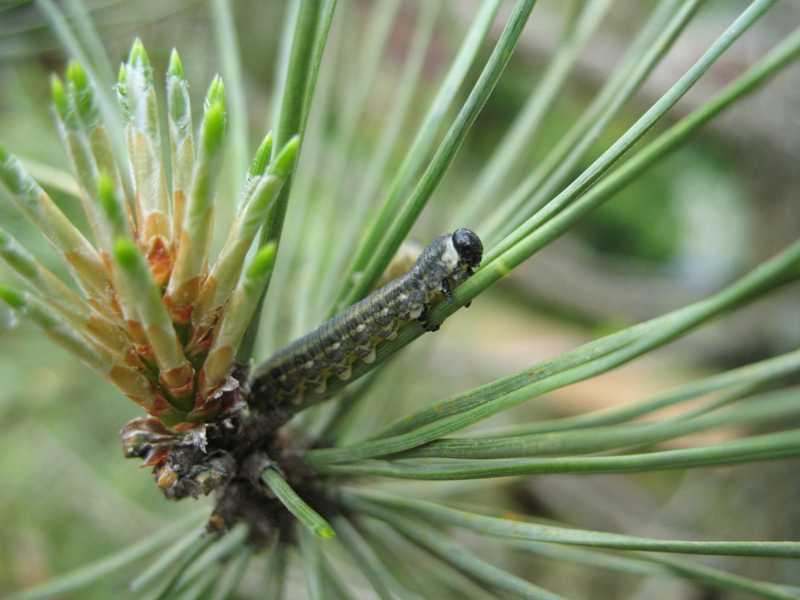 Note that many controls for caterpillars are not effective against sawfly larvae.